As you will have seen from the instagram photos, the kitchen project is under way. Ben, Laura and Hannah came and helped move the contents of the dining room into the living room last night. We took up the old underlay and hammered in or removed old nails. They were rewarded with gelato from Sprinkles. Today, Jon arrived bright and early, and he and Tom went shopping for supplies, and to take rubbish to the dump. 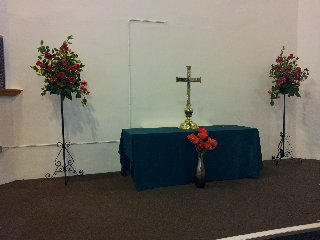 Whilst they were out, I went to church to arrange flowers for Remembrance Sunday. 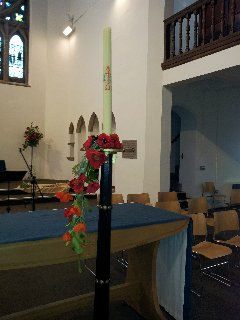 We use silk poppies, which makes things slightly more challenging. 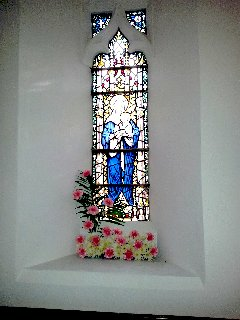 I also used what was left of the arrangements from the wedding to make a little something for the Mary window. 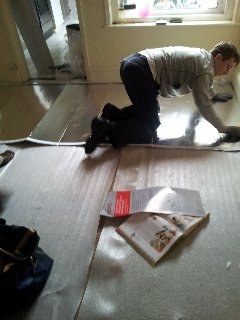 Since I got back, I've been helping Tom and Jon put space age underlay down in the dining room. 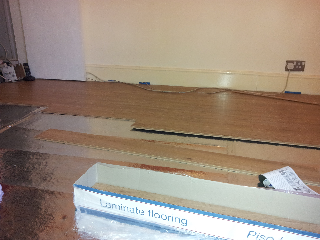 The first planks of the laminate are going in and look lovely. I'm a bit of spare part until Tom goes back to his essay, so I've been making some flapjack. Where we'll be without a kitchen for a bit, I wanted to make something that would keep.